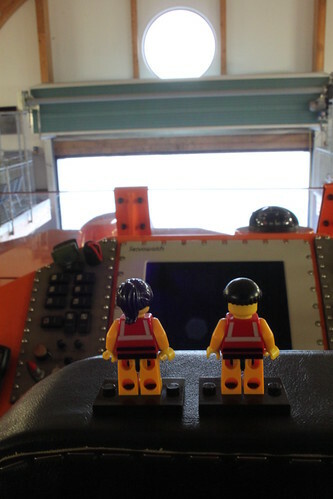 Over the last couple of weeks, I’ve been telling you about the Crew’s visit to The Lizard Lifeboat Station, down in the furthermost – and most beautiful – reaches of Cornwall. 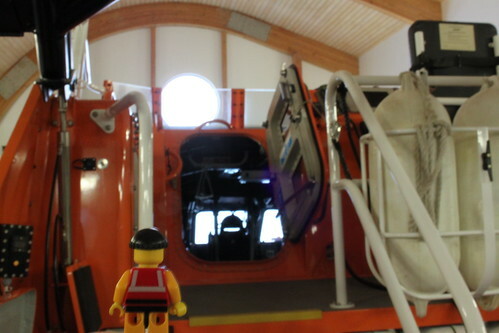 We’ve looked at the station and at the new boathouse, so this week we’re following the little guys around the lifeboat itself. The ‘Rose’ is a Tamar class all-weather lifeboat. She’s just over 16 metres long, 5 metres wide and with a draught (depth below the water) of just less than a metre and a half. She’s powered by two 1,000 horsepower Caterpillar marine diesel engines and weighs a colossal 32 tonnes. She has a crew of seven and a range of 250 nautical miles. The Crew are big fans of the Tamar class of lifeboat, having had the opportunity to look around the one stationed at Salcombe last year. 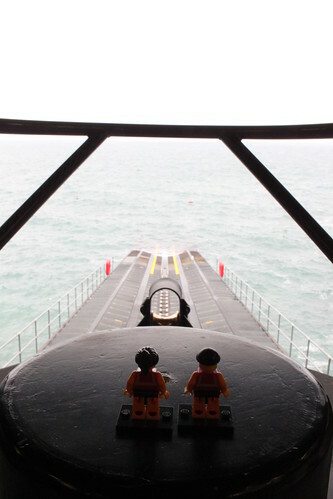 Here they are admiring the view from the foredeck of the ‘Rose’. And here’s the view down the slipway. You can tell why the little guys were so entranced. With the deck and flybridge thoroughly explored, it was now time to go ‘down the hatch’ into the cabin. Mechanic Dave was volunteered to lead the way. 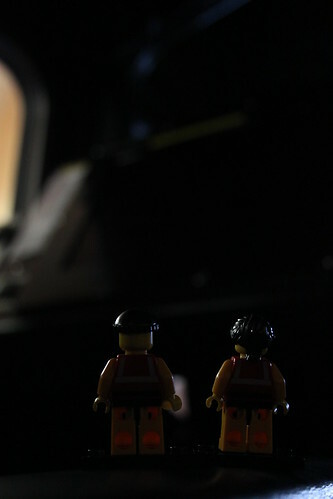 It was a bit dark at first, compared with the bright sunlight streaming into the boathouse through the open slipway doors. But the little guys were gradually able to make out the familiar interior. The navigation station is always one of the Crew’s favourites, as they get to pore over the charts and get a feel for the local area. 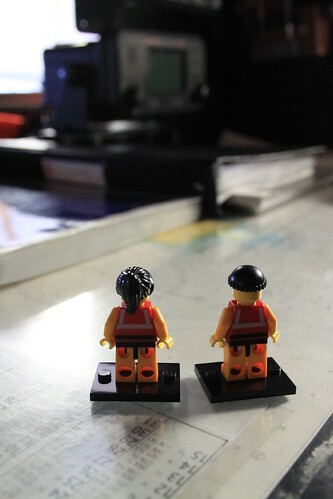 There was also a wide range of communications equipment, vital for keeping in touch with the Coastguard – and everyone else – when out on a shout. 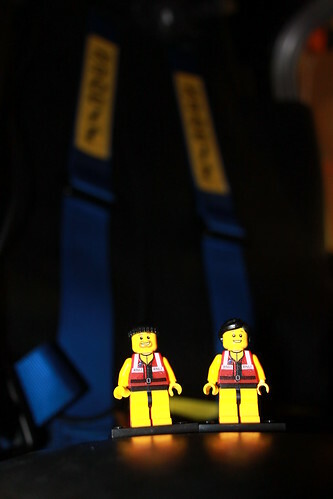 The little guys were extremely impressed with the seats used by the Tamar’s crew. In order to provide the best protection in rough seas, the seats are extremely solid and have their own suspension system, meaning that they can move up and down by 20cm to absorb any shocks that could otherwise injure the crew. The seats also come equipped with harnesses, for when things get very rough indeed. 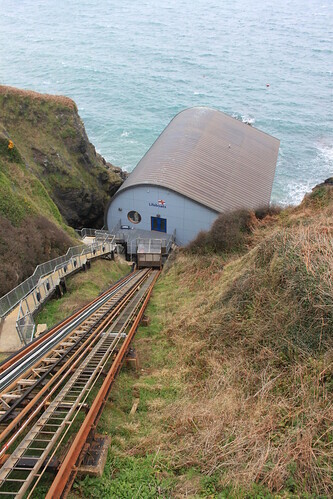 Thankfully, the station’s Mechanic Dan offered to give us a lift on the funicular railway, which operates on a set of rails up the steep slope to the top of the cliff. 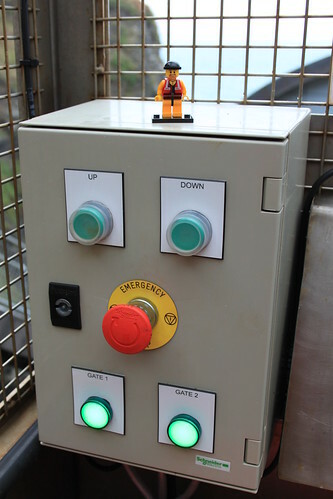 Our own Mechanic Dave was almost beside himself with excitement, especially as he was allowed to operate the controls. And here he is ‘en route’ to the top of the cliff. 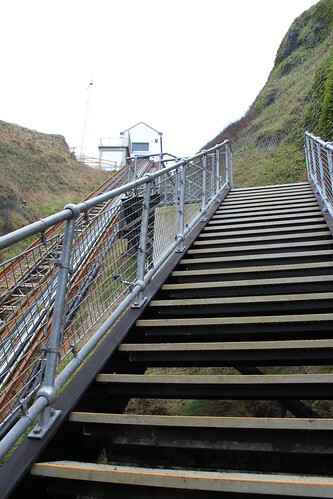 Definitely much easier than climbing up the stairs. Especially when you’re only an inch and a half tall. 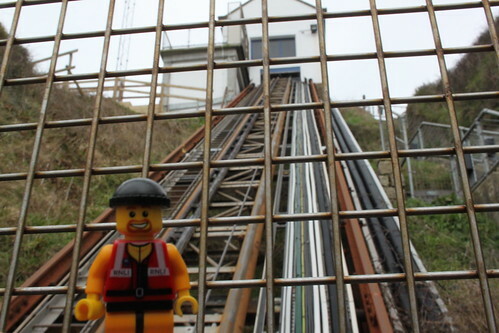 We all thoroughly enjoyed our visit to The Lizard Lifeboat Station. A fantastic boat, a great crew, a top-notch boathouse and a truly awesome location. A massive thank you to the station’s Coxswain Andrew and Mechanic Dan for extending us such a warm welcome. It truly was both an honour and a privilege to meet you. 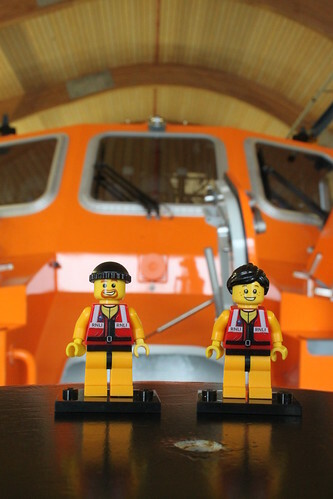 This entry was posted in Out and about and tagged Lifeboats, RNLI, The Lifeboat Crew, The Lizard by Simon Perks. Bookmark the permalink.